Water quality monitoring programs are the heart and soul of so many organizations committed to improving water quality. But these programs have so many different moving parts to maintain: organizing volunteers, training on sampling protocols, managing data, analyzing data, communicating that data to a broad audience, using the data to make informed decisions, and fundraising to keep the programs intact. 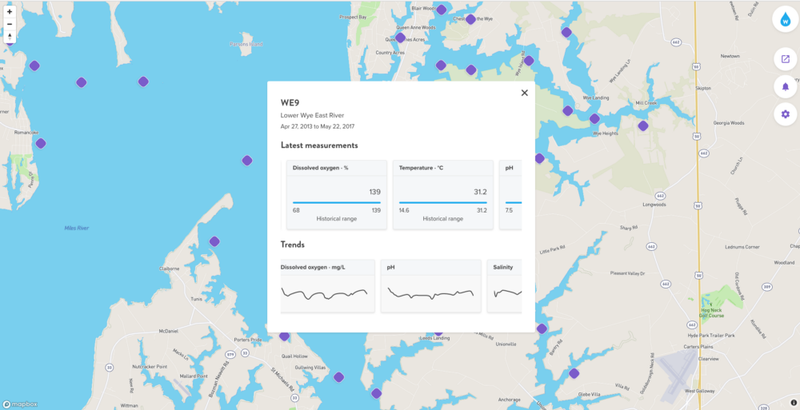 Flow gives groups a platform to visualize water quality monitoring data. The simple upload process yields an interactive and informative map that addresses problems and challenges identified by our user base. Revealing a historic range and the latest value observed at a site. Integrating the the dynamic monitoring map into an organization’s website and merchandizing the results in other online communities like Water Reporter, Facebook, and Twitter. How is my river doing? Did my volunteer restoration work make a difference? Where did my volunteer monitoring data go? A good data visualization requires a succinct, transparent, and informative approach to communicating information. Flow lends itself to automating analysis and results rather than compiling raw data visually. Subscription account holders can create a clean spreadsheet (.CSV) of their data and upload it to Water Reporter to instantly create a map of their monitoring sites. When a user clicks on a monitoring station the map reveals a popup with current and historic data collected at that location. User can click on any parameter to see all of the latest readings collected and toggle a button that reveals information on the importance of each chemical monitored. WE9 Monitoring station showing latest readings and trends. These maps are portable and with the helpful embed code, users can drop it into an organization’s website and anytime upload a new master sheet of readings to update the map and analytics. Users can even leave notes with a readings update that gives a individuals an overview of the results (Try clicking on bell located on the right side of the map)!